I'm tracking two of these market movers right now. Both are faced with macroeconomic madness… Only one is set to sell itself into oblivion and irrelevance amid plenty of cheerleading from the pundit class. But the other whale is making some unorthodox – and therefore controversial – moves that should ensure its continued survival and prosperity. 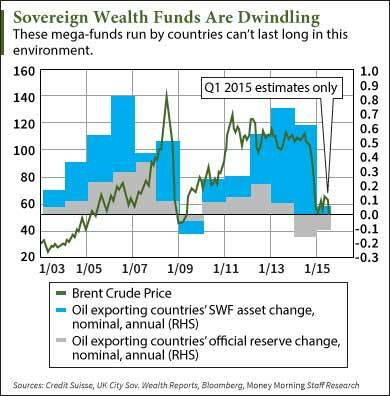 Sovereign wealth funds (SWFs) have been very active of late. Most of them are large, national funds set up to accumulate and manage the proverbial "wealth of nations." According to Credit Suisse Group AG (NYSE ADR: CS), sovereign wealth funds currently control in excess of $4 trillion in assets typically invested in stocks, bonds, and other financial instruments. Of that total, nearly $1.8 trillion was accumulated in the 2009-2014 period. In many cases, that wealth comes from oil production and export. In years past, with oil far north of $100 a barrel, these funds grew and grew, just piling up assets for a rainy day. It's estimated that as of October 2015, Saudi Arabia and Kuwait each had about $500 billion, Abu Dhabi over $700 billion, and Norway around $900 billion. Problem is, it's nigh impossible to make any money on oil when it's trading at $35 a barrel or less, as it has been for months now. So sovereign wealth fund "piggy banks" are being tapped at an increasing rate to fill budget gaps, to do everything from keeping the trains on time to staving off violent revolution. That's meant selling… lots of selling. It's also why global stock markets have seen an increasing correlation with world oil prices in the last couple of years. The problem is, eventually, they'll run out of assets to sell, and it's going to be quite a long time before we see oil prices as high as we did in the last decade. And needless to say, the governments who run these funds often make suboptimal investment decisions. I think sovereign wealth funds are out of breathing room, and that's likely to cause serious trouble in the months and years to come as governments' budgets begin to fail them. But… there are other large institutional investors who, while equally large and influential, have proven to be better allocators of capital. I have no doubt that their independence has everything to do with that success. And that's why, despite some dubious criticisms, their investment choices are worth tracking – even more so when those choices are considered unconventional. Reinsurers, of course, are insurers to the insurance companies, assuming part of their risk. And Germany's Munich Re (BIT: MUV2) is one of the largest reinsurance companies in the world. Besides acting as consultants to the insurance industry, Munich Re provides reinsurance in the life, health, casualty, fire, transport, aviation, and engineering sectors. In 2015, Munich Re had $56 billion in revenue and an investment portfolio (float) worth $261 billion. After 136 years of successful operations it would be fair to say Munich Re knows how to manage its float, the total of funds from collected insurance premiums that haven't been paid out in claims. Reuters reported company CEO Nikolaus von Bomhard said at a recent press conference that, "We are just trying it out, but you can see how serious the situation is." The "it" von Bomhard was referring to is his firm's gold and cash allocation, and the "situation" is the European Central Bank's adoption of a negative-interest-rate policy (NIRP). You see, Munich Re is now estimated to be holding about 285,000 ounces of gold, and physical cash worth in the double-digit millions of euros. News of those holdings then prompted the kind of predictable response you'd expect from some of the least credible critics. UniCredit's chief global economist Erik Nielsen told CNBC that, "If they (are buying gold) physically then they really have lost their mind… I wonder if they are trying to send a political message (rather than investing their money wisely)." Similarly critical was Tatton Investment Management's chief investment officer Lothar Mentel, who told CNBC that he can kind of see the justification for warehousing cash, but with gold's volatile past, he feels holding gold might be a "very risky approach to dealing with NIRP." Yet Munich Re's managers are no dummies. They're extremely risk-conscious investors simply reacting to an environment without historical precedent. In order to counter these financially repressive policies, von Bomhard said his company has held gold as part of its portfolio and recently added physical cash. He added, "What we are seeing right now is exceptional and I'd say that it's horror. You can see some of the markets already being emptied… The side effects of the ECB policy are of course now having quite devastating consequences. I think they are solving the wrong problem with the wrong remedies." Now that Munich Re has broken the ice, I think odds are good other large institutional asset managers will follow closely behind. That's why it's so important to move now, while prices are good. After all, one of the biggest arguments against owning gold has been its inability to pay interest or dividends. Detractors say that opportunity cost doesn't justify holding it. But with negative-interest-rate policies, that argument no longer holds water. 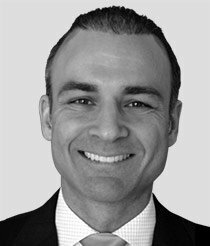 There's still time to follow in Munich Re's lead and acquire gold to help diversify your portfolio. Remember too that gold is the only true asset that's not simultaneously someone else's liability. So buy some physical gold while it's still cheap. And if you want an easy way to include gold in your investment account, look to the Sprott Physical Gold Trust (NYSE Arca: PHYS). It holds gold bullion that is fully allocated and stored at a secure third-party location in Canada, subject to periodic inspections and audits. There is no levered financial institution between investors and the gold, plus U.S. investors holding for at least 12 months can benefit from a 15% (approximately) capital gains tax versus the 28% rate with most precious metals exchange-traded funds (ETFs). Many consider gold as insurance. But now even the reinsurers want to hold this kind of insurance. We'd be wise to follow suit. Gold is always a smart investment, but plenty of investors don't realize how versatile it really is. Grab Michael Lewitt's 2016 Gold Profit Playbook to make sure you're getting the absolute most out of your yellow metal. Click here to access the playbook and get your complimentary subscription to Michael's Sure Money service. Notable and puzzling, so try doing both by split the funds.